Cities are taking extra precautions to make sure drivers pay attention to pedestrians. Hamtramck has several accident prone pedestrian intersections. Take a 12-minute drive or roughly double that time by bicycle from Hamtramck to the intersection of Cass Avenue and Hancock St. The corner is notable for having three of Wayne State University’s most cherished historic buildings: Old Main, the Hillberry Theatre and the recently renovated Thompson Home. What is equally striking is that the intersection now has signs on both sides of the crosswalk reminding motorists that state law requires that they yield to pedestrians crossing Cass. 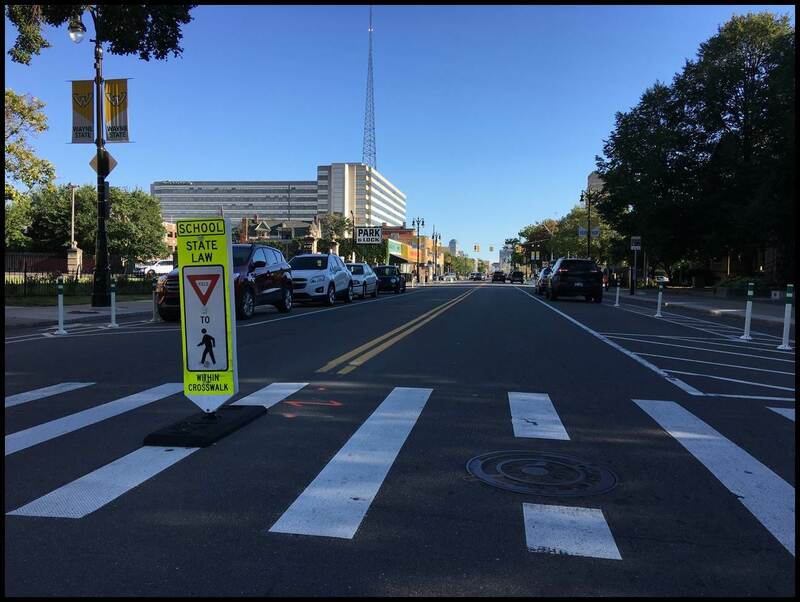 If you go about 45 miles west to Ann Arbor, crosswalk signage goes a step further: the city adopted an ordinance that requires that all vehicles stop, not only yield, for pedestrians standing at the curb or within a crosswalk. Traverse City also has a similar ordinance, which requires drivers to yield to pedestrians in unmarked crosswalks, and stop for pedestrians in marked crosswalks. Earlier this year MLive reported that the Grand Rapids City Commission approved an ordinance that “requires motorists to fully stop for pedestrians at marked or unmarked crosswalks, except for intersections regulated by police or a traffic signal. Some criticism was also heard that it took the accidental death of a pedestrian with a high degree of influence in the community for the ordinance to be enacted. In Hamtramck it should not take a serious or fatal accident — no matter who is involved — to get our attention. In fact, several incidents over the years should have already done that. Just a few years ago — when the Jurkiewicz & Wilk Funeral Home on Caniff and Brombach was hit by a speeding motorist, killing the inhabitants of the vehicle and doing significant damage to the building — there should have been an immediate official response from city and community leaders that now is the time to change the culture of driving in Hamtramck from fast and reckless to slow and careful. The accident happened at night. But on the opposite corner is a charter school — Caniff Liberty Academy — and the Hamtramck Public Library is on the same block as the funeral home. That is a high visibility intersection with a high concentration of pedestrian traffic. The accident was a tragedy, but it could have been even more catastrophic. It is time that Hamtramck joins other cities that recognize the importance of slowing and calming motor traffic, making streets safer for everyone. There is no logical reason why speeding should be tolerated in Hamtramck, essentially an urban village where walking, running, cycling, skating are all part of the urban mobility spectrum that all modern cities — large and small — must accept as the new normal. Last month I wrote of Detroit’s commitment to “Complete Streets” principles. Those need to be discussed in joint meetings of the city council and the school board and implemented by city management. Why wait? Why not innovate and make headlines as a place where public safety is the highest priority? We are talking about nothing less than a campaign to challenge the car-dominant street culture of the past 100 years. It’s true there has been increased awareness of this lack of balance between motorized and pedestrian traffic over the past two decades. But not here. Many cities have attacked the problem with strategies that have proven effective in creating a more level playing field. If you or I go for a walk we should not fear that a motorist will disrespect our right to lawfully cross the street. Yet, on most of my walks I have to put out my hand as I cross, say, Yemans at Gallagher, reminding drivers that I have the right of way, not them. Or if a car blocks my way in that same crosswalk I wait before moving, sometimes engaging the driver in non-threatening conversation, reminding him or her that this space is not shareable while I am in it. I no longer use the common folk wisdom — to defer to the motorist and walk behind the car to the other curb — that I learned growing up on these streets. These are a daily occurrence, examples of a chronic imbalance on Hamtramck streets. A good first step would be signage that reinforces the obvious rule of law: pedestrians come first, motorists must yield or, better yet, stop for them at marked or unmarked crosswalks. Yes, it can be done here, and should be done here as if — to repeat myself quite consciously until more people begin listening and leaders act responsibly — lives depend on it. They do. There is a culture of youthful speeding drivers in Hamtramck. Unless aggressive police enforcement occurs you will not see this problem abate. Mr. Wasacz – new stop signs have popped up. I have come across 2 of them, one of which is TOTALLY unnecessary… The city must have taken note of your observation.